All photos by Anne Meador. 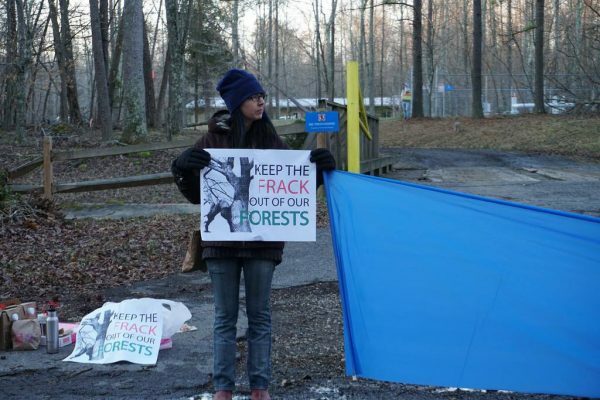 Workers were temporarily blocked from entering the site of a proposed compressor station in Southern Maryland early on Thursday morning. 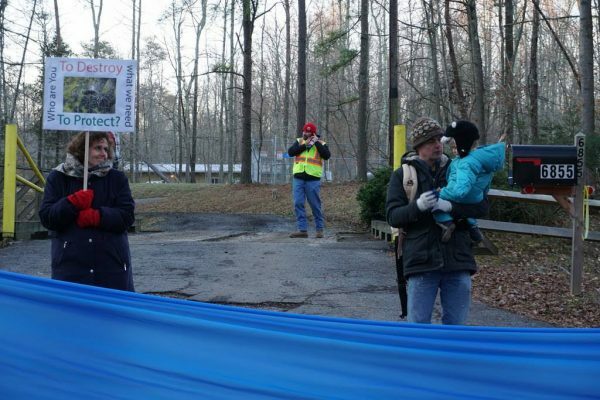 Seven people and a baby pulled a wide streamer of blue fabric across the entrance to a Dominion-owned site, where tree-felling has begun for a proposed compressor station. The project hasn’t yet received all the necessary permits, but FERC gave Dominion the go-ahead to clear 13 acres of trees and vegetation. Protesters say they were symbolically “flooding” Barry Hill’s Road with the blue barrier, drawing attention to the fact that the road is prone to severe flooding. Dominion’s ability to provide adequate response to any emergency situation has been challenged by the community during six hearings of a Charles County zoning board since July. The compressor station is purported to help supply gas to the Mattawoman power plant, now under construction, but critics contend that its real purpose is to provide compression for increased volume of gas being transported to Dominion Cove Point’s newly opened export terminal. The site is located on the Cove Point pipeline.